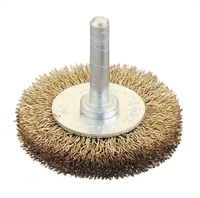 Applications: These brush wheels are useful for cleaning the inside of pipes and tube ends. They will also strip rust and coatings off external surfaces. Product Notes: The wire used in brass coated steel which has increased flexibility and increased life compared to plain steel equivalents. They are oil-free. Spindle diameter 6mm. Sold in packs of 12 wheels.